A surprisingly large group of candidates applying for jobs lack a decent set of insightful questions to ask the Interviewer. According to Global Healthcare IT, Inc.’s CEO, Michael Williams – a 30 year veteran of the IT recruitment industry – many candidates have none, few, or bad questions they wish to ask an interviewer. 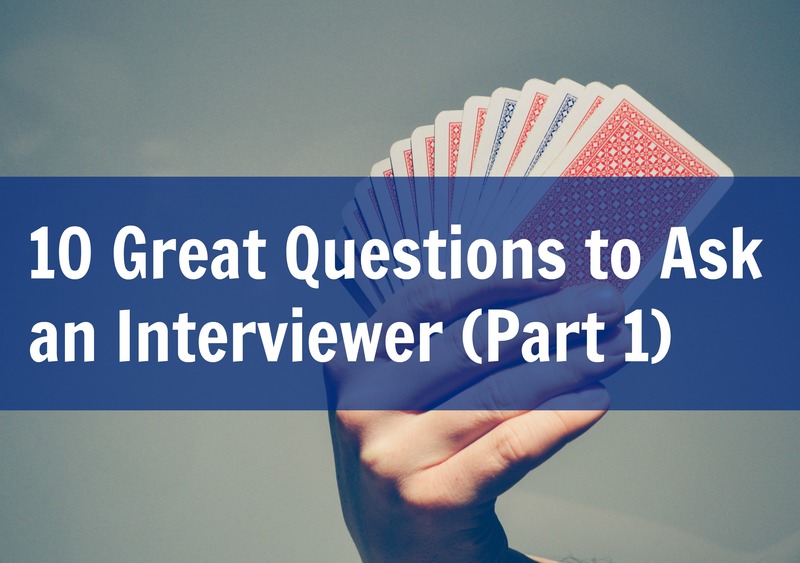 Great questions can really set apart a good candidate from an average applicant. The following set of questions is the first in a set of three Great Questions to Ask Series. For more details click here. The primary caveat to great questions is to ask open questions. Why are open questions so great? Open questions cannot be answered with a simple yes or no. They require the person to expand on their answer. Why is the role open?The answer will allow you to see if this is a corporate expansion, a technical knowledge need, or increase level of business that created the role. A more concerning situation may be high turnover in this job.Other answers may point to a lack of promotion or uncompetitive salaries. Normal staff attrition is not necessarily a problem. This one question could really help you decide if the role is right for you. How long has the role been open?Roles that have been open for a long period could point to a potential issue. This could be due to lack of competitive salary, location, excessive travel, lack of future prospects, poor product, bad service delivery, or work away from home.The time span the job has been open could also be as a result of a high level position, or a need within it for a specialized or rare skill, or perhaps a super picky client. Roles that have sat on the market for a long time can be great, as it may give you more leverage with the client. What are the challenges you are experiencing?The answer to this question is self-evident. What are you looking for in the ideal candidate?This is a super question. It allows the Interviewer to reveal hidden portions of the job, or mismatches on your resume. You then have the opportunity to tailor your answer to encompass the differences, and show you are the perfect fit. If not, this answer will show how you can train to become the ideal candidate. How can I clarify my answers to help you make a decision?This is another super question. It forces the Interviewer to identify any outstanding issues or concerns they have with you and at the same time gives you an additional opportunity to accurately align yourself with the role and the company. What are the growth opportunities?This shows the interviewer you are looking longer term, that you are ambitious, and that you intend to be a leader in the company. It also provides you with a clear view if there are no further opportunities to progress. What is the best part of working for your team/company?This question gives the Interviewer the chance to genuinely sing the praises of the company and show you what a wonderful opportunity this is. Conversely, it may show you that there is no upside to the opportunity and/or the company lacks direction, or is a dull place to work. What makes me a good fit for this position?This question makes the Interviewer identify your good points and how you might fit into the role and company. As with some of the other questions, this could highlight a deficiency or concern and will give you the potential to address the problem. What are the next steps?By carefully listening at this point, you will gain an insight as to whether you are likely to proceed. Clear, unambiguous answers to this question with definite plans and mention of you mean a probable move forward situation. Any mention of having a lot of candidates to interview or referring to the process in the third person may mean you are less likely to proceed. For more advice on landing great jobs read the additional articles on our FAQs or Blog page. Part Two of this series will be published on August 17th. Part Three of this series will be published on August 24th. Primary contributors: Ryan Prosio, Lead Recruiter, Global Healthcare IT, Inc.
Bettsy Farias, Business Analyst, Global Healthcare IT, Inc.